. . . WOMEN’S EQUALITY . . .
Women’s rights, voices and participation must be at “the centre of peacekeeping decision-making”, United Nations Secretary-General António Guterres told the Security Council on Thursday [April 11], describing them as “central to sustainable solutions” to challenges facing the Organization worldwide. Through its landmark resolution 1325 on women and peace and security, the Council reaffirmed the participation and involvement of women, which the UN chief hailed as “a key element in the maintenance of international peace and security”. He also noted the UN’s “essential system-wide effort” to enhance women’s representation at all levels and in all arenas, through his Strategy on Gender Parity. “This is not just a question of numbers, but also of our effectiveness in fulfilling our mandates”, he stated, citing evidence that more women peacekeepers lead to more credible protection responses that meet the needs of all. In patrol units women can better access intelligence to provide a holistic view of security challenges, and at checkpoints they promote a less confrontational atmosphere, he said. Within troop contingents they lower incidences of sexual exploitation and abuse; yield greater reporting of sexual and gender-based violence; and can access local women’s networks, leading to more inclusive peace processes. The Secretary-General thanked the more than 150 Member States who have signed on to his Action for Peacekeeping (A4P) initiative, which calls for women’s participation in every stage of peace operations, and integrates a gender perspective into all analysis, planning, implementation and reporting. And he was grateful to the States who, at last week’s Ministerial on Peacekeeping, launched the Elsie Initiative to break down barriers to increasing women’s participation in peace operations. In support of the UN’s commitments in these areas, Mr. Guterres noted a range of actions, including the Gender-Responsive Peacekeeping Operations Policy, which “commits us to promoting leadership and accountability both for gender equality and for the women, peace and security agenda”. Flagging that since December 2015, the number of women in uniform has increased by only around one per cent, he spelled out that “this is clearly not enough”. “This year”, he informed the Chamber, “we rolled out the Uniformed Gender Parity Strategy ”, which, among other things, targets by 2028 a range of 15 to 35 per cent of women’s representation, including military, police and justice and corrections personnel. UN Resolution 1325, does it make a difference? While acknowledging that it “has been more challenging”, Mr. Guterres vowed “to press ahead”, adding that “keep on track, we need assistance from you, the Member States”. He asked for a greater focus on women in battalions and formed police units and for the sustained recruitment and deployment of women within national services. 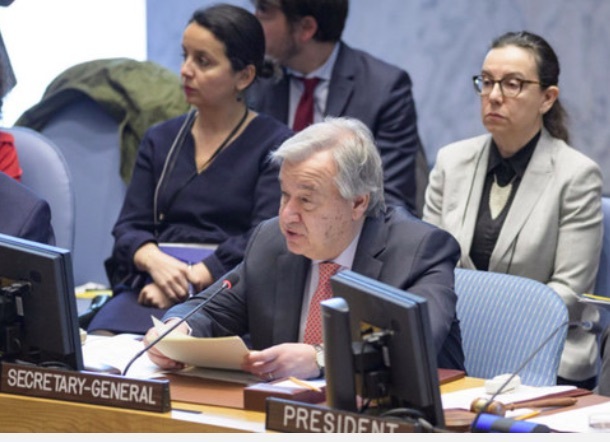 Noting that for the first time in UN history the senior leadership is close to achieving gender parity, Mr. Guterres reiterated his commitment to sustaining that progress: “We need to bring the same spirit to our peace operations”, he stressed. “This is crucial for our effectiveness, credibility and reputation”. The first female Force Commander and current Head of the UN Truce Supervision Organization (UNTSO) mission, Major General Kristin Lund told the Council that the “momentum of pushing gender equality must be kept”. As Force Commander of the UN mission in Cyprus, she teamed up with Lisa Buttenheim, the Special Representative at the time. “For once I did not need to convince my boss that gender was important” she said. “Both of us had gender equality in our spine”. The Major General enumerated some examples of her work in increasing the number of women, helping them in missions and reaching out to local communities. Noting many reasons why the armed forces have a difficulty keeping women in the ranks, she outlined frequent obstacles thrown up by male culture in military settings, giving the example of how “posters with half naked women” hang in mission gyms. “How many women do gym in bikinis?” Ms. Lund asked rhetorically, saying that under her command in Cyprus “womanized posters vanished”. She also mandated that the all-male teams in military skills competitions had to have females. “Gender is on the top of my agenda”, she said, adding that she initiated a female military network, engaged women to become more visible and increased the number of female observers. Troop and police contributing countries “must do more” she said. “We, out in the field, need to be able to reach out to the whole society. Only you can make that happen”, the Force Commander concluded. Chairing the meeting, German Federal Minister of Defense, Ursula von der Leyen said: “Women are no better peacekeepers than men, but they are different. And this diversity is a strength”. Pointing out that Resolution 1325 has been in effect for almost 20 years, she maintained that it is “still far from full, effective and meaningful participation of women in peace operations”. To change that, Ms. von der Leyen suggested, among other things, to have successful female mentors to share their stories to younger women; have more women in national forces for deployment to international peacekeeping missions; and assess national barriers that keeps more women from joining peace operations. “The peacekeeper’s blue helmet symbolizes protection and security”, she said. “Let us make this helmet be worn by more women. For the sake of peace”.